A crumpet is neither a scone nor a biscuit, and while it might resemble a small pancake, it is not a flapjack either. So, what is a crumpet? "A crumpet is a crumpet," says Tony Guerrero, owner of the Scrumptious Crumpets cafe in Sellwood. He goes on to describe it as "round and spongelike" and further notes that it is not baked, but rather is cooked on a flat-top griddle. The batter is hand poured into a custom-made ring, and the resulting crumpet is nearly half an inch thick. "The texture, after being toasted, is more complex than a scone. The flavor, texture and things you can do with a crumpet are much wider than most baked goods," Guerrero says. Guerrero says that Scrumptious Crumpets is, as far as he knows, the only crumpet cafe in Oregon. He also thinks he probably is the only "crumpetier" who has served the delicious treat to The Who, when that band played in Portland. In the late 1980s, Guerrero was a cook at the Tea and Crumpet Shop in San Francisco. "This was in between my skateboarding and late night punk and rock and roll days as a musician," he says. Fast forward to 2017, when Guerrero, now a Sellwood resident, started making crumpets for friends and family. "They pushed me into the idea of selling them, so here we are," he says. He opened the cafe in October 2017 and also began wholesaling crumpets to other cafes. "I wanted to try and do a few things with crumpets to prove to myself, and to show other small coffee shops that they don't need a large kitchen in order to serve a lot of variations around a crumpet," Guerrero says. He notes that crumpets make a really good and interesting base to work with, and they freeze well for a longer term, unlike most baked goods. "We also have a unique robotic coffee machine that does a nice, freshly ground pour-over coffee. I figured that if we were going to do something different, we may as well go all out," he says. "We've become a cool little breakfast/brunch/snack cafe, filling a void in Westmoreland." Guerrero always tells people trying a crumpet for the first time to keep it simple — just go with a toasted crumpet, butter and jam, and after that, go crazy. The most popular menu items are an egg-and-bacon crumpet, or simply butter and a spread. "A lot of times, people will come in and order some variation of an egg crumpet, then also get a sweet one as well," Guerrero says. He also has come up with an apple pie crumpet, which consists of a toasted crumpet, butter, apple butter and sliced apples, all topped with whipped cream. "I dot a little maple syrup on top to add a hint of maple flavor and to give it a little bit of an aesthetic," he says. And then there is "The Elvis." "It has peanut butter, sliced bananas and bacon, just like the sandwiches that Elvis used to make," Guerrero says. Most Americans don't know what a crumpet is, and so people admit to Guerrero that they often pass by his place for months before deciding to go in and see what the cafe is all about. "We really rely on word of mouth. 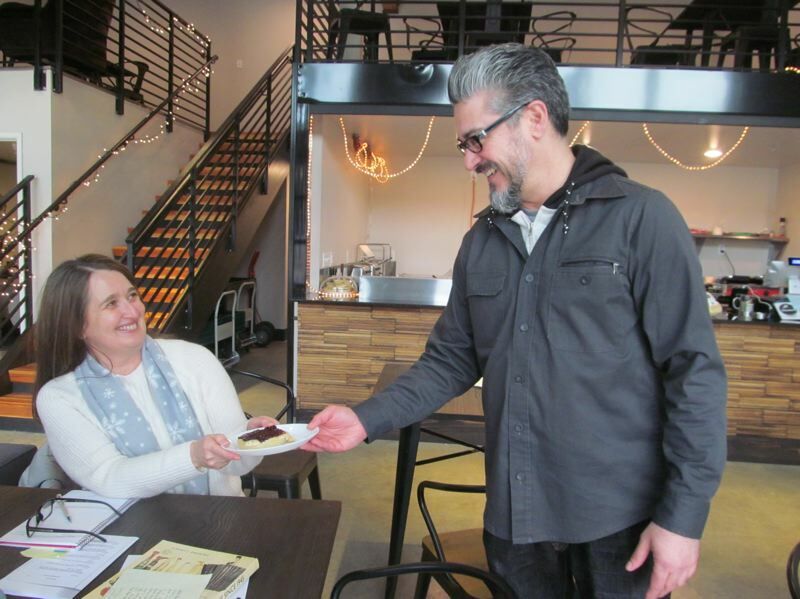 We have been known to stand on the corner of (Southeast) Milwaukie and Bybee and hand out samples because we are also off the beaten path, tucked away in the back lobby of the Galaxie apartment building two blocks south of Bybee," he says. Scrumptious Crumpets, 7414 S.E. Milwaukie Ave., is open from 8 a.m. to 2 p.m. Thursday through Sunday. For more: www.scrumptiouscrumpets.com.